If there was ever a contrarian play, it’s the coal sector today. 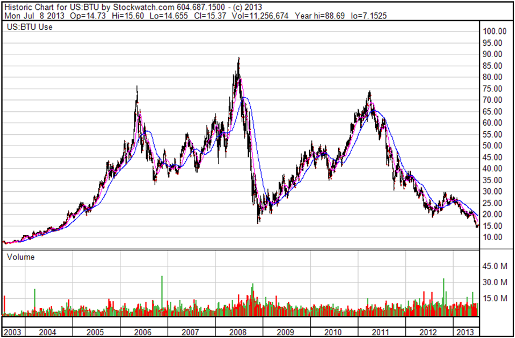 Major coal producers like Peabody Energy (NYSE-BTU) are trading below the levels they saw during the height of the 2008 financial crisis (see chart below). So what could be scaring investors more than the end of the financial world? Why are they dumping coal miners at such an unprecedented rate? Bad politicking. A combination of a perceived “war on coal” from the Obama White House with a sudden edict from China that the world’s largest consuming nation may restrict its imports of lower-quality coal. Throw those whammies together with bad markets for miners in general and you have a formula for multi-year lows in producing stocks. The generally negative atmosphere around coal has bred a set of knock-on concerns. Analysts have trotted out supply expansions in Indonesia and Australia as a threat to prices. Others point to “faltering” Asian demand as a weight ahead on the market. But a look at the numbers (the recent numbers, not the dated 2011 figures used by many brokerages) shows a much more interesting picture. Growing demand from some unexpected places, and supply that might not be keeping pace as much as some believe. What’s more, the supposed China coal ban now looks like it will be scrapped before it ever sees the light. All of which makes coal markets look much more positive. Especially the Asian coal markets—the ones beyond the reach of the White House and the coal-critical American public. Below, we look at what’s happening in Asian coal—and how it might benefit producers like Peabody who supply these energy-hungry markets through their Australian coal mining operations. As Asia goes, so goes global coal. Most of the world’s major coal-exporting nations are focused on Asian markets. The world’s top thermal coal exporter Indonesia sent over 95% of its product to Asian countries in 2012. 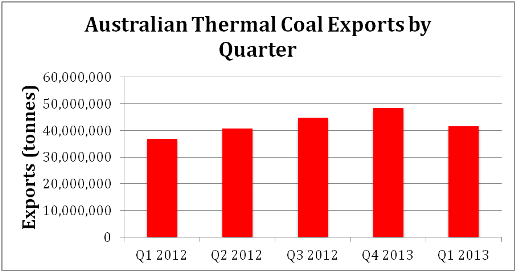 Likewise number two exporter Australia, which shipped 98% of its thermal coal to Asia during the first quarter of 2013. These two countries are obviously influenced by geography. But even South Africa—with shipping access to markets other than Asia—is increasingly sending its exports eastward. The U.S. is the only major coal exporter not dominated by Asian demand (to date mainly shipping to Europe). But even that could change. Concern has been that Asia’s hunger for coal may be dwindling. For some parts of Asia, this is probably true. China—by far the world’s largest coal importer—brought in 62.3 million tonnes of thermal coal between January and May 2013. That puts the mega-consumer on pace for about 150 million tonnes of imports during the full year. That would indeed be only slightly higher than the 146.9 million tonnes China imported during 2012—indicative of slowing demand. The chart below shows how Chinese imports have leveled off in 2013, after going on a tear through 2011 and 2012. Number two coal consumer Japan also shows signs of tapering demand. 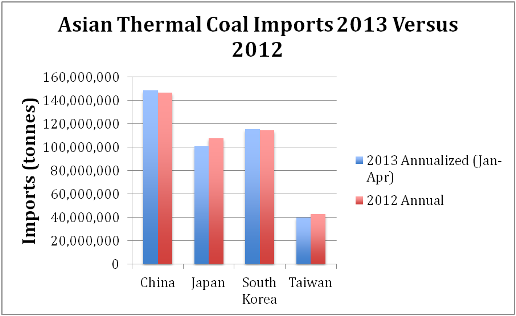 Japanese coal imports took a notable jump in 2012. The nation brought in 107.7 million tonnes of thermal coal, up 6.4% from the 101.2 million tonnes Japan imported in 2011. But Japanese imports appear to be reverting to the mean as some of the nation’s nuclear power infrastructure comes back on line. Between January and May of 2013, Japanese thermal coal imports totaled 42.3 million tonnes. Annualized, this points to total 2013 imports of somewhere around 101 million tonnes. Close to Japan’s five-year average import level. Important consumers South Korea and Taiwan also show a similar holding pattern. Korean imports from January to May totaled 48.1 million tonnes—up just slightly from the 47.0 million tonnes imported during the same period of 2012. Taiwan’s January to April thermal coal imports were 13.3 million tonnes. Just slightly below the 13.8 million tonnes imported during this time in 2012. 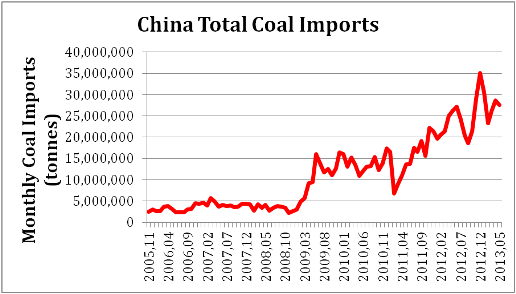 As the chart below shows, it looks like the “heavyweights” of Asian coal demand won’t increase imports much this year. But won’t lose a lot of ground either. The numbers so far in 2013 suggest that overall demand from mainstay coal importers will decrease slightly from 2012 levels. China, Japan, South Korea and Taiwan are on pace to import about 405 million tonnes, down from 412 million tonnes in 2012. That’s a loss of 7 million tonnes of import demand. But a new player looks poised to pick up that slack (and more): India. An Indian coal crisis has been brewing for quite some time. The country has a large coal-fired power sector—over 106,000 MW of installed generating capacity. All told, these coal plants require 1.44 million tonnes of coal daily. India has vast coal resources. But domestic production has been lagging, weighed down by a corrupt licensing system. Many awarded coal blocks have gone undeveloped, instead being flipped for financial profit. This “coalgate” scandal has recently been front-page news, with politicians at all levels of government implicated. The same bureaucracy has also delayed the building of critical infrastructure. Roads and rail needed to move coal to market aren’t anywhere close to complete. The net result is that 13% of Indian power plants are running at “critical” levels of coal supply. Having less than 7 days of coal feed stockpiled. A handful of plants are even at “super critical” levels of stockpiles, with less than 4 days of supply on hand. With no quick domestic fix in sight, India has turned to thermal coal imports. And the growth has been phenomenal. In the fiscal year ended March 31, 2013, India brought in 88.8 million tonnes of thermal coal. An all-time high, and up 27% from the 69.7 million tonnes imported in the fiscal year ended March 2012. Incredibly, import levels have doubled over the last two years. Meaning that India has added 48.6 million tonnes of new demand to the import-export market since 2011. Indications are Indian demand will continue to grow. Monthly imports hit a record in May 2013, at 13.4 million tonnes. Indian thermal coal imports grew by nearly 20 million tonnes during the past year. And it appears that continued growth this year should more than make up for the 7 million tonnes of lost demand projected above for China, Japan, South Korea and Taiwan. Demand is not an issue for Asian coal. But could increased supply be a weight on the market? Producers in leading exporting nations Indonesia and Australia have indeed been ramping up output as demand boomed. The response has been most obvious in Indonesia. Thermal coal exports between January and April 2013 hit 101.4 million tonnes, up 16.2 million tonnes—or 19%—from the same period in 2012. Annualizing the numbers, it appears Indonesia will export over 34 million tonnes more coal this year than in 2012. A significant increase. The picture from the other major export market to Asia—Australia—is less clear. Australian production ramped up a lot during 2012. You can see below how exports grew from 36.9 million tonnes in Q1 2012 to 48.5 million tonnes in Q4 2012. However, recent data shows a reversal in the growth trend. Imports for Q1 2013 dropped off to 41.6 million tonnes. Why? There’s been a lot of rumbling about Australian producers cutting back output due to low prices (the average export price in Q1 2013 fell to A$89.31, from an average A$101.48 in 2012). The production cost base in Australia is indeed much higher than Indonesia, where exports are still going strong. We may be seeing lower prices start to impact supply. If we annualize Australian exports so far in 2013, it points to yearly shipments of around 166 million tonnes. That would actually be less than the 171 million tonnes Australia exported in 2012. What Does This Mean for Coal Stocks? Taking the numbers so far for 2013, it looks like overall Asian coal supply will increase by around 30 million tonnes this year. Almost all of that is growth from Indonesia. It also appears that demand from east Asian countries will fall by 5 to 10 million tonnes. Giving us a surplus in 2013 of 35 to 40 million tonnes, as compared to 2012. The key question then is: how much of this overhang can coal-hungry India absorb? Indications are, quite a bit. Remember that India imported 88.8 million tonnes in the last fiscal year. Meaning that imports over the current year would need to grow to just under 130 million tonnes in order to soak up the 40 million tonnes oversupply. That equates to monthly Indian demand of 10.8 million tonnes. Compare that figure to India’s record May imports of 13.4 million tonnes. It starts to look like the “over-supply” might end up being the “India supply”. Such a scenario would be good for all thermal coal producers, as it should put a floor under prices. But some nations will benefit more than others from Indian demand. Indonesia and South Africa are big suppliers to India. 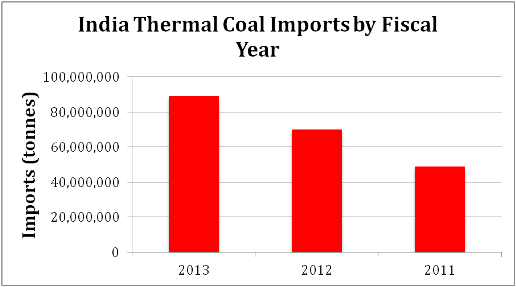 In 2012, Indonesia sold over a quarter of its thermal coal exports to India. Australia however, doesn’t currently ship a lot that direction. Australian producers only sold 2 million tonnes to India in 2012, out of a total 170 million. We’ll be watching to see how Indian imports hold up. And find out if production falls further in Australia. But if the trends continue as today, bargain basement-priced coal producers (especially those selling to India) should offer considerable value.